NOBODY KNOWS the changes that farmer Howard Holtz of Cropwell Road has seen in the 65 years he has lived there. Today his farm sits in the middle of the suburban sprawl. Howard Holtz describes farming as "a poor way to get rich but an awfully nice way to live." He should know. He's lived in the same farmhouse on Cropwell Road in Evesham since 1914. He's seen the railroad give way to Route 70; Route 70 become a busy commercial strip; and the developers come and go. 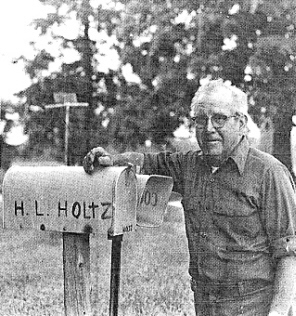 Holtz, who at 75 has sun-burnished skin and a delightful way with an interviewer, sat on the front porch of the solid old ("we're not sure when it was built") house with the cacaphony of Route 70 audible throught the trees ("I planted most of them") recently, and talked about the changes he has seen. "We were tenant farmers," the Elm, N.J. native said. "This whole area was one huge farm". After getting married, Holtz was "talked into" buying the house and a surrounding parcel of 100 acres, which stretched across both present Route 70 [and Cropwell Road]. He remembered how the purchase came about. "The whole farm was owned by William B. Lippincott", he said. "He was 80 years old. We called him Grandpop. He had long whiskers he would tuck into his pants." One day "Grandpop" came by in a wagon and invited Holtz to jump in. "He offered me the property", he said. "I told him I didn't have the money. He said he would take the mortgage and I should take care of the interest, the insurance and the taxes, and pay him when I could". Even though Holtz knew he "couldn't go wrong", he still needed some persuading. Fellow farmers Charles Collins, who owned the land where the Clover store on Route 70 now stands, and Bert Stow, who owned a farm on the eastern side of Route 73, "talked me into it" Holtz said. That was in 1928. "I've never been sorry", he added. Shortly after he bought the farm, the Depression set in and times, as everyone knows, were hard. Fortunately for Holtz and his family, he had made the purchase agreement with Lippincott and was able to remain solvent, switching to dairy farming in 1936. The next crisis for the farm came with the wave of post World War II development, the first ripple of which touched Holtz when Woodstream was built in the mid-1960's. "That was the first," Holtz recalled. "But we couldn't have asked for a nicer builder." Even when construction along the creek caused the wells on Holtz's property to go dry one summer day, the developer let the farm hook into the water lines that had been laid for the homes. Then the parade of developers began. "Hardly a day would go by that one of them didn't come to the door" Holtz said. "Sometimes two of them." The first part of the farm to be sold was the portion where the 7-11 on Route 70 now stands. That went, Holtz said, because increasing traffic on Route 70 made it impossible to get farm machinery safely across. The next parcel was "everything on the eastern side of Cropwell Road," where a supermarket promptly went up. It is now the Grossman's building supply store, but holtz said the structure has "never bothered" him and his wife Laura, despite the fact that it sits directly across from the house. But as for the house and the remaining 21 acres, the Holtz's are standing their ground--for now. "We listed it with a real estate man, at our price," Holtz said. "We hope it's enough so that no one takes it right away." Listing the property with a professional has relieved Holtz of having to talk to developers. "They're OK until you talk about what you want," he chuckled. The farm is still active, Holtz noted. One of his two sons lives in a nearby house and plants soybeans, alfalfa and other hay crops. He also raises a few heifers. Holtz himself keeps busy by helping his son and in his own vegetable garden. All the years of hard work and all of the changes have made Holtz somewhat philosophical. "A farmer has three things against him," He said. "Weather, crops and price." He can't control any of them. These days inflation is taking its toll on the farmer, he added, as is the shortage of gasoline. Nevertheless, farming has for Holtz and his family (his daughter is married to a farmer and his other son works for the township) has been a satisifying life. "My wife and I talk about moving, but where would we go?" Holtz said. "We've been here so long we don't want to leave. We've been used to a farming life."